Burn MKV to Blu-ray disc/DVD/Data Disc on Windows and Mac. Edit MKV videos before burning to Blu-ray disc. Offer 100+ free menu templates for Blu-ray disc menu. 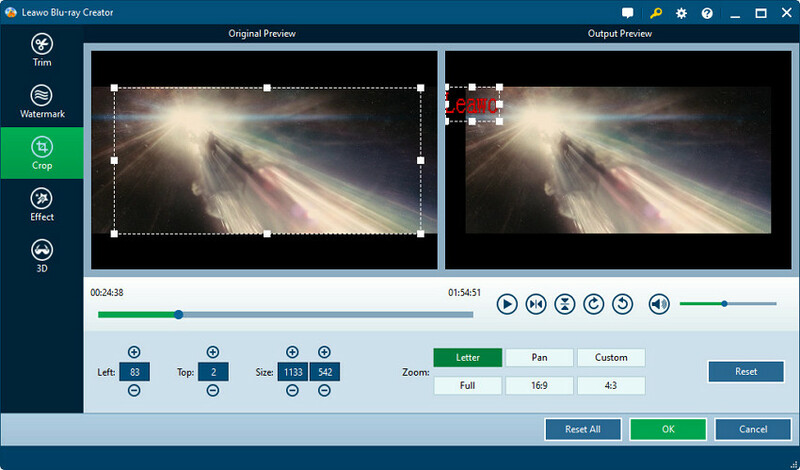 Toolbox with more functions such as Video Editor, ISO to DVD, One-click Burn, etc. When burning video files we have such a wide range of format to choose from. When watching our video files we want to have the best quality possible and a crisp image on our devices. It is for this reason that one of the most popular formats is .mkv. It has the ability to download and convert video files into pristine high definition format such as 1080p and 720p. It is also great for combining multiple aspects of video data into one file such as audio and subtitles. This is probably the biggest reasons why it is so popular amongst people. However, one fault that is experience with. mkv files is that they do not always play on your Blu-ray machine. It is fruitless in trying to play high definition files on your phone, tablet, or computer – where is the fun in enjoying a crystal clear image on such a small screen? Watching it on a Blu-ray player provides entertainment for the whole family and if you have a surround sound system you will be able to get the theatre experience you have always wanted right there in the comfort of your own home. Some Blu-ray players can decode .mkv data, but many of them do not have this function. We have all experienced that dreadful moment when the error message pops up on your screen telling you that you are unable to watch the video file you have just compiled. The best thing to do would be to burn MKV to Blu-ray format so that your device can support it. When you do this, you will not have to worry about losing any of your data and your image will stay crystal clear and pristine as it should be. The only difference will be that you will now be able to view it on your television screen! Now, let's learn the top 6 MKV Blu-ray Burner to burn MKV videos to Blu-ray disc on Windows/Mac. Among many DVD creators that are available on the internet, Wondershare DVD Creator is one that is highly preferable by many Windows and Mac users worldwide. 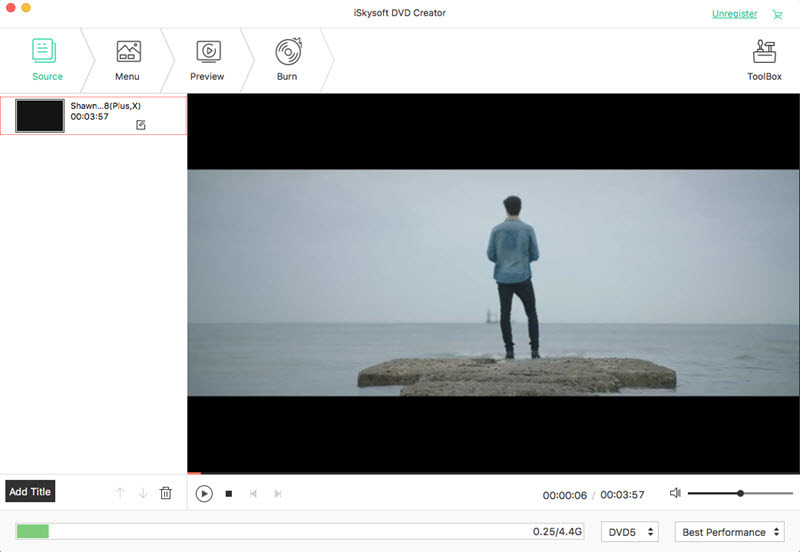 It offers one-click feature to burn MKV to Blu-ray disc, and has an inbuilt DVD video editor that has editing features such as trim, crop, adding watermark or subtitle and many more. It is one of the most powerful software to customize your DVD to a great extent and cover all the needs of DVD with ease. Wondershare DVD Creator is compatible with almost all disc types so you can burn videos in any format to Blu-ray disc, DVD, Data disc with multiple storage. · Burn MKV and other formats videos to Blu-ray Disc/DVD/Data disc on Windows and Mac. · Create MKV Blu-ray disc with real-time preview, super fast burning speed, and high quality output. · Edit MKV videos before burning to Blu-ray with features of cropping, trimming, editing subtitle, adding watermarks, etc. · Choose free Blu-ray menu template from 100+ designs with Travel, Movie, Holiday, and more themes. · Customize Blu-ray disc menu further by changing background picture, adding music, creating chapters, and others. · Additional functions such as Data Disc, ISO to DVD, Photo Slideshow, Video Editor, One-click to burn DVD/Blu-ray Disc, etc. 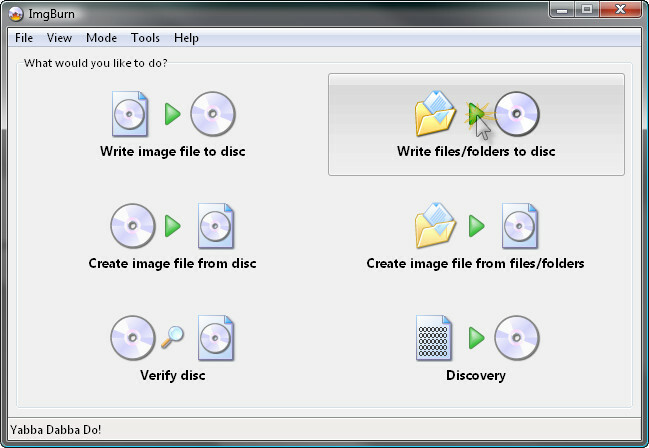 To begin the process, download Wondershare DVD Creator from its official website on your computer and run the software. After that, choose the option Create a Blu-ray(BDMV) Disc from the homepage. Click on the " + " icon under the Source tab to add MKV files that you want to burn to Blu-ray disc. Or you can add your desired MKV videos from computer to software via drag and drop. You are allowed to import multiple MKV files at once. Thereafter, the software will display the thumbnails of your video on the left side of the interface, along with the name and length of the video. You can edit your MKV videos by clicking the pencil-like icon on the thumbnail, you can crop, trim, add music, or add effects to your MKV video to make it as you want. Tap on the Menu tab and you will see the Main Structure on the left side. You can select DVD Templates which are on the right side. 100+ different style templates are provided. You can make further customization by clicking the icons upon the menu preview window, where you can change aspect ratio, background image, background music, and text to the videos. 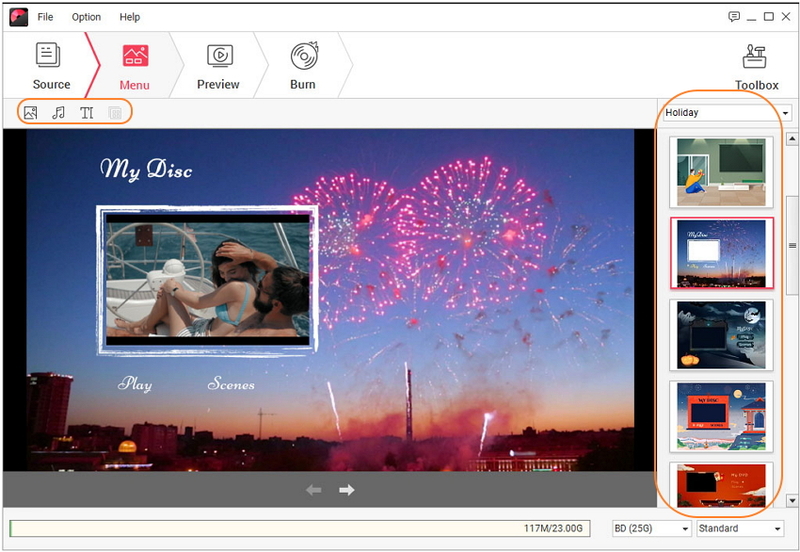 Now, you can preview your video by selecting the Preview tab and make changes to your video before burning. If everything is good, then tap on the Burn tab and choose Burn to disc option. 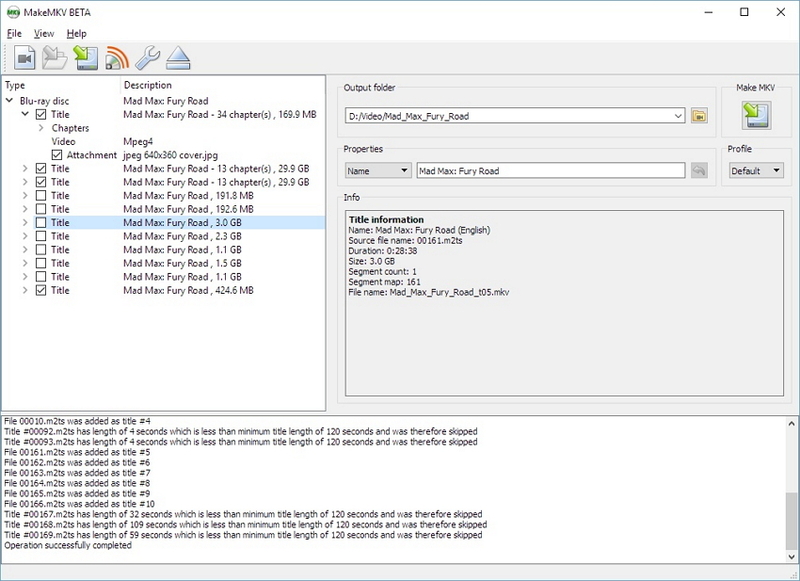 Fill the Burn Settings and hit the Burn button to start the MKV to Blu-ray burning process. Wondershare DVD Creator maybe the best Blu-ray creator to burn MKV videos, but you can still learn other Blu-ray burners so that you can make a better choice. Here we list other top 5 MKV to Blu-ray burners for Windows or Mac. Aleesoft is one of the ideal ways to convert MKV to Blu-ray. It is the software that allows users to convert MKV to various formats that work on other platforms seamlessly such as iPad, iPhone, Zune, Apple TV, Blackberry and many more. Moreover, it works with almost all type of video and audio formats which include MP4, AVI, 3GP, FLV, WMV and many more. It is considered the ideal free MKV audio and video converter that covers all requirements. Apart from converting MKV format to another, it also offers a plenty of video editing features before conversion such as crop, pad, split and merge. It is completely safe and secure to download on the computer as it is 100% virus free and clean MKV converter software. While using this software, you will not get any ads as it is completely ad-free tool. No matter in which format you want to convert MKV, the Aleesoft has enough capability to do it with ease. With the help of it, you can ever merge as much as video files into one. It even allows you to extract subtitles from MKV file and then, add them to converted one. Price: Its Pro version cost $29.95. iSkysoft is another best MKV to Blu-ray software for both Windows and Mac version. It is highly preferred by many users worldwide and it has many users that love this tool for converting or burning video to Blu-ray hassle-free. It is the next generation software that has significant DVD creator features for users. To make attractive and trendy videos, iSkysoft is an ideal choice for many. It offers ultra-speed in converting MKV format to Blu-ray. It is not only for converting MKV format but has enough power to convert other file formats such as FLV, MP4 to Blu-ray. 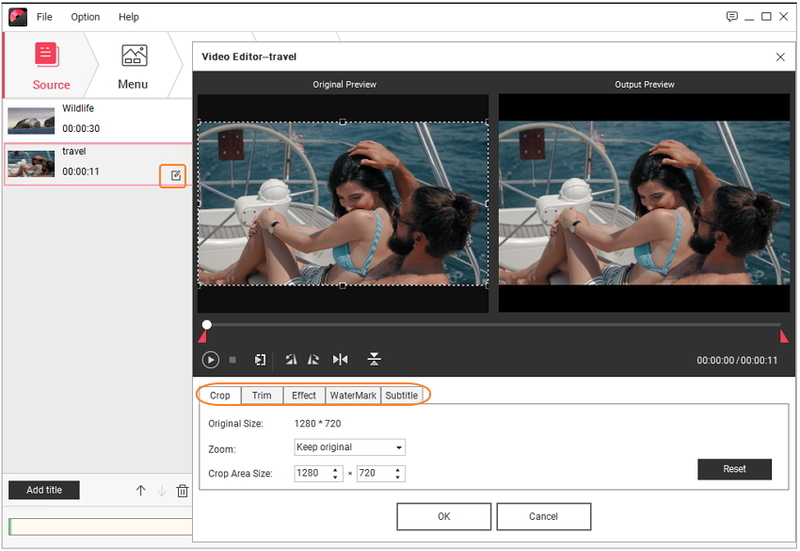 Before converting your file, you can even customize your video with a lot of editing features that software provides to users. You can even modify DVD menu templates to create personalize video as you want. To make your DVD special, iSkysoft software plays a vital role. Moreover, it even lets you burn videos that are downloaded from online sites like Facebook, Google Videos and Youtube. It is compatible with all latest Windows and Mac version. This tool is preferred by many leading companies worldwide such as IBM, Nike and many more. For users who want cool editing effects, it is the best one to consider. Price: Its price for Windows users is $39.95 and for Mac users is $49. ImgBurn is one of the most lightweight MKV to Blu-ray converter that you can have as compared to other tools. It offers several features which work superbly. It covers almost each and every conversion requirements for users. It is compatible with every Windows version included the latest one. It is the most flexible software which offers multiple advanced features that are not present in others. It is the best one to create high-quality DVD video from various formats with great ease. It even allows users to burn Audio CD from various file types. Its biggest advantage is that it supports many formats of images, videos, and audios. It can even be used to burn Blu-ray disc. For Mac users, it is not available and that is its disadvantage. It is known as the most efficient disk burning tool that offers many burning features. It is the tool that fully supports Unicode file name so it means it works seamlessly when you are working with the international character set. Price: It is completely free to use. Leawo is free MKV to Blu-ray burner that let users convert as well as burn videos to Blu-ray. It is not for just MKV to Blu-ray, but you can use this software to convert various videos formats to DVD, ISO. It provides many editing features along with converting and burning videos to Blu-ray. It is considered the most comprehensive yet simplest and easiest tool. It supports more than 180 video formats. It offers more than 40 free disc template and menu are present in the software for customization according to your preference. With the help of Leawo Blu-ray Creator, you can burn 2D video to 3D Blu-ray or DVD along with almost six different effects. It includes a built-in video editor that allows you to edit your videos to make it more attractive. It offers user-friendly software. So, it is easy to operate and use. It is 100% safe to download on the computer as it is clean software that offers fast processing of its feature. Now, it works with Windows 8 version seamlessly. It is the software that is specially designed for enjoying Blu-ray HD videos or movies as it offers 3D video effects that are hardly present in others. Price: Its Video Converter Ultimate for Windows is $69.95 and its Video Converter Pro for Mac is %39.95. MakeMKV offers a one-click feature to convert MKV format to Blu-ray. It is completely free to download on Windows and Mac. It is known as the perfect format converter. It is able to read Blu-ray disc that is protected with AACS or BD+. It is the software that allows you to play Blu-ray, DVD discs on your favorite player or device hassle-free. It converts one video format to another without losing its quality and content. It is one of the video converters which offers the fastest conversion as compared to its counterparts. The best part of the software is that it does not require any additional tool for conversion and decryption. It's each and every feature is free to use including the Blu-ray that is not free in other tools. Moreover, it preserves entire meta-information such as track language and type of file. After the conversion, nothing will be changed such as quality. It is a legal tool that aid users to convert Blu-ray disc and it is even the best one to protect copyright. With the help of it, you can convert Blu-ray to MKV files also. Price: It is free to use. Thus, now you are aware of free tools that can help you to burn MKV to Blu-ray disc and you can choose as per your requirements. However, Wondershare DVD Creator is always what we recommend most as its all-in-one functions, clear interface, and good using experience. You can download the free trail version on your PC/Mac via the download button below, and you will like it.